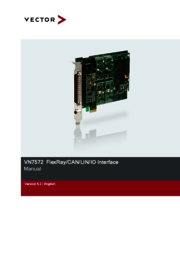 User Manual for the VN7572 FlexRay/CAN/LIN/IO Interface. Handbuch für das VN7572 FlexRay/CAN/LIN/IO Interface. User guide for all cabs, piggies, cables and other accessories for CANboardXL (PCI, PCIe, PXI), CANcardXL, CANcardXLe , CANcaseXL, CANcaseXL log, VN16xx, VN26xx, VN3xxx, VN7600, and VN89xx.